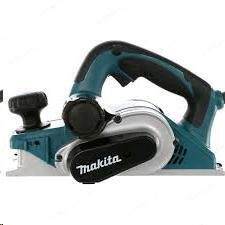 The Makita 3-1/4 in. Corded Planer delivers power and exceptional cutting capacity for a wide range of applications. Easy to use, this planer has a powerful 16,000 RPM, 7.5 amp motor with a 2-blade cutter head for fast stock removal and planes up to 3-1/4 wide and 5/32 in. deep in a single pass. Ideal for professional construction, framing, window and door installation and fine woodworking, this tool is loaded with convenience features, including an ergonomically designed rubberized grip and a depth adjust knob for precise depth adjustment. Powerful 7.5 amp motor weights only 7.3 lbs. * Please call us for any questions on our planer power 3 inch rentals in Olympia WA, Lacey WA, and Tumwater WA.